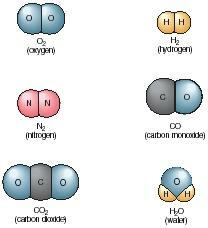 A molecule is a particle consisting of two or more atoms joined to each other by means of a covalent bond. (Electrons are shared in covalent bonds.) There are a number of different ways of representing molecules. One method is called an electron-dot diagram, which shows the atoms included in the molecule and the electron pairs that hold the atoms together. Another method is the ball-and-stick model, in which the atoms present in the molecule are represented by billiard-ball-like spheres; the bonds that join them are represented by wooden sticks. A third method is called a space-filling model, which shows the relative size of the atoms in the molecule and the way the atoms are actually arranged in space (see Figure 1). Atom: The smallest particle of which an element can exist. Chemical bond: An electrical force of attraction that holds two atoms together. Covalent bond: A chemical bond formed when two atoms share a pair of electrons with each other. Compound: A substance consisting of two or more elements in specific proportions. Element: A pure substance that cannot be broken down into anything simpler by ordinary chemical means. Molecular formula: A shorthand method for representing the composition of a molecule using symbols for the type of atoms involved and subscripts for the number of atoms involved. Molecule: A particle formed when two or more atoms join together. Structural formula: The chemical representation of a molecule that shows how the atoms are arranged within the molecule. A compound is formed when two atoms of an element react with each other. For example, water is formed when atoms of hydrogen react with atoms of oxygen. The reaction between two atoms always involves the exchange of electrons between the two atoms. One atom tends to lose one or more electrons, and the other atom tends to gain that (or those) electrons. In general, this exchange of electrons can occur in two ways. First, one atom can completely lose its electrons to the second atom. The first atom, with fewer electrons than usual, becomes a positively charged particle called a cation. The second, with more electrons than usual, becomes a negatively charged particle called an anion. A compound formed in this way consists of pairs of ions, some positive and some negative. The ions stay together because they carry opposite electric charges, and opposite electric charges attract each other. Sodium chloride is a compound that consists of ions. There is no such thing as a molecule of sodium chloride. Instead, sodium chloride consists of sodium ions and chloride ions. In many instances, the reaction between two atoms does not involve a complete loss and gain of electrons. Instead, electrons from both atoms are shared between the two atoms. In some cases, the sharing is equal, or nearly equal, with the electrons spending about half their time with each atom. In other cases, one atom will exert a somewhat stronger force on the electrons than the other atom. In that instance, the electrons are still shared by the two atoms—but not equally. Electrons shared between two atoms are said to form a covalent bond. The combination of atoms joined to each other by means of a covalent bond is a molecule. Consider the situation when the electrons that make up a covalent bond spend more time with one atom than with the other. In that case, the atom that has the electrons more often will be slightly more negative than the other atom. The molecule that contains this arrangement is said to be a polar molecule. The term polar suggests a separation of charges, like the separation of magnetic force in a magnet with north and south poles. But now think of a molecule in which the electrons in a covalent bond are shared equally—or almost equally. In that case, both atoms have the electrons about the same amount of time, and the distribution of negative electrical charge is about equal. There is no separation of charges, and the molecule is said to be nonpolar. Structural formulas. A structural formula gives the same information as a molecular formula—the kind and number of atoms present—plus one more piece of information: the way those atoms are arranged within the molecule. As you'll notice in Figure 2, structural formulas help differentiate between substances that share identical molecular formulas, such as ethyl alcohol and methyl ether. Could you tell me if we could use ethyl chloride in a clean room for packing a medical device? Does it produce particles when sprayed? this was great and it helped me find out the ansewr very well.